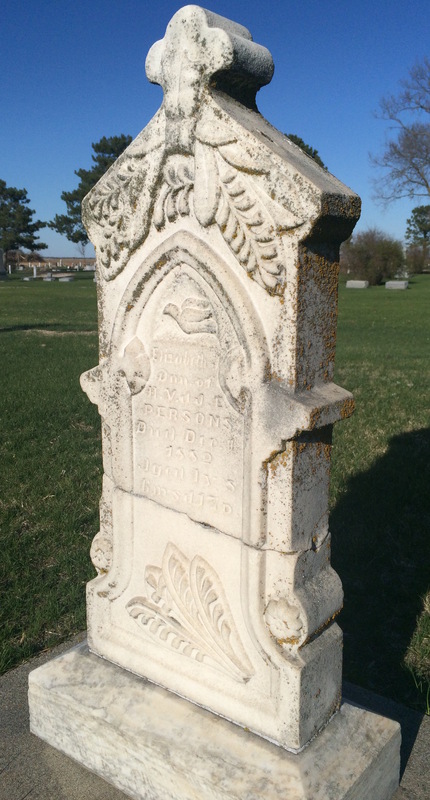 Last week, I shared some stories about my visit to Central City Cemetery. A kind reader, Nancy Johnson, left a comment that filled in some of the gaps about the history and people I mentioned. 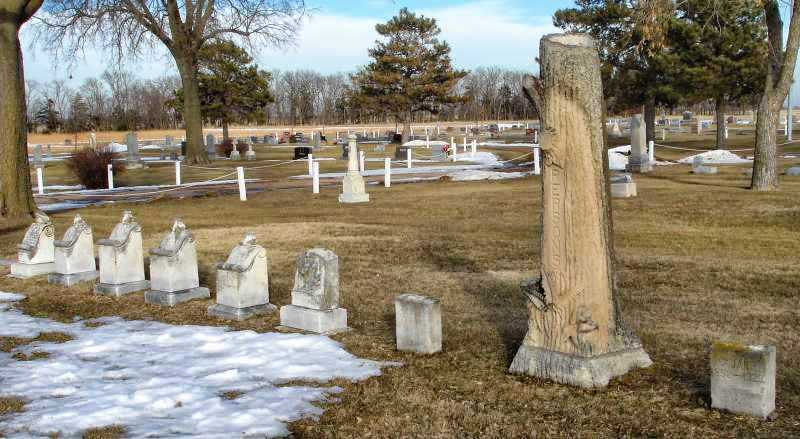 She said the cemetery (established in 1877) was originally located on south Highway 14 on the west side of the street. 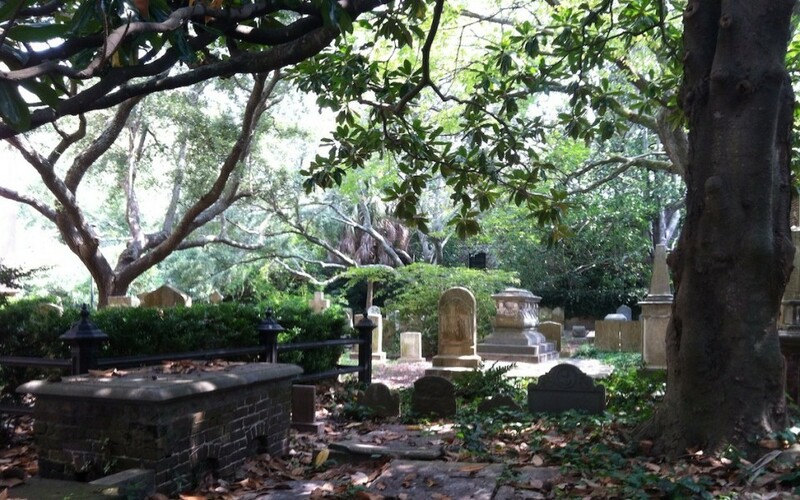 Graves were moved from that location and from other small and private cemeteries. If you want to learn more about Anna Holtorf and the Rev. Wesley Wilson (not Willson as inscribed on his monument), I’ve added Nancy’s information to the original blog post. Jessie Baker’s monument has a little crown on it. I see many lambs, flowers and crosses on monuments but not crowns. Especially on a younger person’s marker. It made me curious to find out more. Daughter of Ruben and Lurancy Baker, Jessie and her two brothers were born in Pennsylvania before coming to Central City. Eldest brother Burton was a school teacher while Mark taught music, according to the 1880 U.S. Census. Jessie was a bit younger than her brothers, who were both in their 20s. She was only 13 when she died. 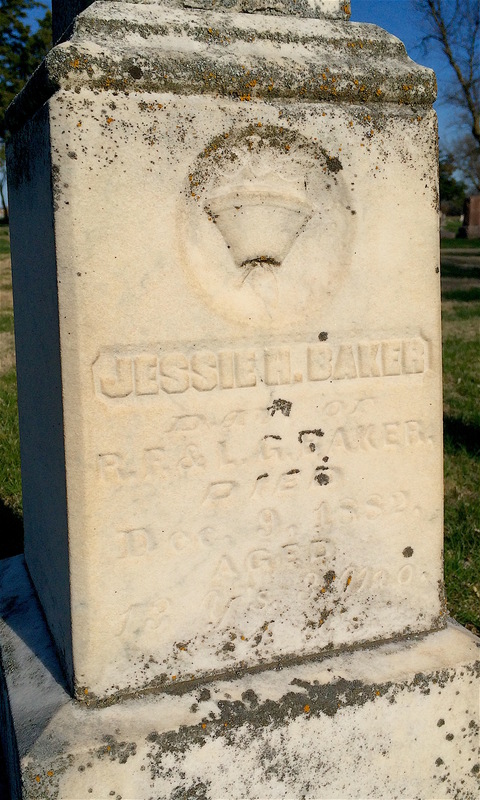 Jessie Baker was a 13-year-old schoolgirl when she died in 1882. My apologies for the blurriness of the photo. Possessed of an active, cheerful, and affectionate nature, she was a great favorite with her schoolmates, while her earnest and studious disposition gained her the love and esteem of her teachers. Her courage and cheerfulness never flagged during her sickness, and this fact gave hope of her recovery almost to the end. Ruben Baker’s profession was listed as “tombstone agent” in the 1885 Nebraska Census. Perhaps that’s why he was able to purchase this monument featuring a crown motif, which I don’t often see for younger people. On the 1885 Nebraska Census, Ruben Baker’s profession is listed as “tombstone agent.” This was not always a full-time job but was combined with others and he was primarily a farmer. In reading the obituaries of others buried at Central City, fall 1882 through 1883 was a year in which many children in Central City died of diphtheria. It’s a disease you don’t hear about in the U.S. now because it’s so incredibly rare. Between 2004 and 2015, 2 cases of diphtheria were recorded in the U.S.
Immunization against diphtheria began in the 1920s but before then, it killed thousands. The U.S. recorded 206,000 cases of diphtheria in 1921, resulting in 15,520 deaths. One family that truly suffered during that 1882-1883 diphtheria outbreak was the Persons family. 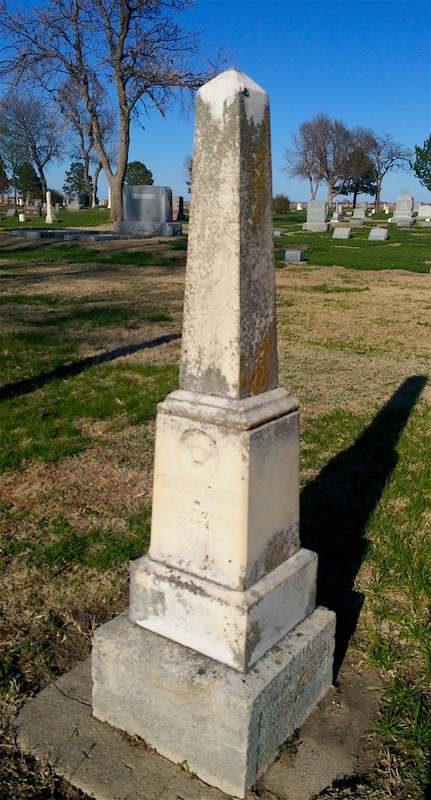 The photo below of the Harrison E. Persons family plot was taken by Ann Berry for Find a Grave. I tried to piece together the timeline of children and birth/death dates, but if I have made an error, please let me know. The grave stones for six of Harrison E. and Chrissie J. Persons’ children. Three died of diphtheria. The parents’ stones are on the left and right of the tree monument. Photo source: Ann Berry, Find a Grave. In 1871, Harrison W. and Mary Fish Persons moved from their native Vermont to Central City with their large family (some already adults). Three of their sons were Fred, Harry V. and Harrison E. Harrison (the elder) built a small general merchandise store in Central City that he later expanded. In 1876, Harrison E. married Chrissie Jane Burk, who came from Ohio to Central City with her parents Henry and Lucinda Burk. By 1880, Harrison E. and Chrissie had two children, Jessie, 2, and Franklin “Frankie”, 1. In November 1880, a daughter, Hattie was born. She died on January 15, 1881 from unknown causes. Sadly, most of the branches on the Persons family tree were cut far too soon. In cemetery motifs, ferns convey frankness, humility, and sincerity. Frankie died of diphtheria on Dec. 26, 1882. 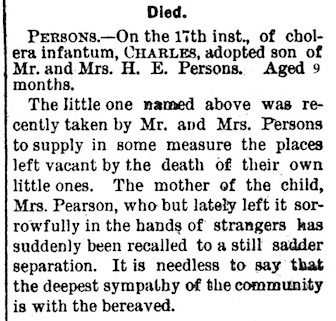 On Jan. 6, little Percy (who was only 10 months old) died of diphtheria as well. Finally, on Jan. 9, Jessie died at the age of five years, 2 months and 22 days. All of Harrison E. and Chrissie’s children were gone. Of the many who have been lately bereaved by that dread scourge, none more richly deserve the sympathy of the community than the family of H.E. Persons upon whom the hand of affliction has fallen with rapid strokes, until their home has been left utterly childless. The father and mother have watched and hoped…that their household might pass unscathed by the destroyer. The entire community, many of whom have lately stood agonized and helpless at the bedside of their own little ones, sympathize deeply with Mr. and Mrs. Persons in their affliction. Amid their sadness, the couple adopted a baby named Charlie who would die a few months later in September 1883 (not of diphtheria). Chrissie gave birth to a boy, Willie, in 1887, but he died in 1891 for unknown reasons. Cholera infantum (more often dysentery) was once a common killer of infants in the summer months. It shouldn’t be confused with Asiatic cholera, often caused by unclean water. Notice printed in the Sept. 20, 1883 Central City Courier. Brother Fred and his wife, Jennie, were also hit by tragedy during the “dread scourge”. Their children, Bertha and George, died within days of each other in October 1882. Lizzie Persons was only four when she died during the “scourge” of 1882. Their daughter, Lizzie, died on Dec. 1 at the age of four of diphtheria. Harrison E. died only a year after Willie in 1892. I could only find one other mention of Chrissie, who was living in Cedar Rapids, Iowa in 1917 according to a city directory. She died in 1929. She is buried with her husband and their children. Harry V. died in 1906 and Fred died in 1926. All of them are buried at Central City Cemetery. Chrissie Persons is buried with her family. She outlived all of them. There are countless others who died during that tragic period that are buried at Central City Cemetery. Some of their graves are marked but I’m certain there are even more that are unmarked. Near the end of our visit, I caught sight of a monument that I wanted to look at more closely. 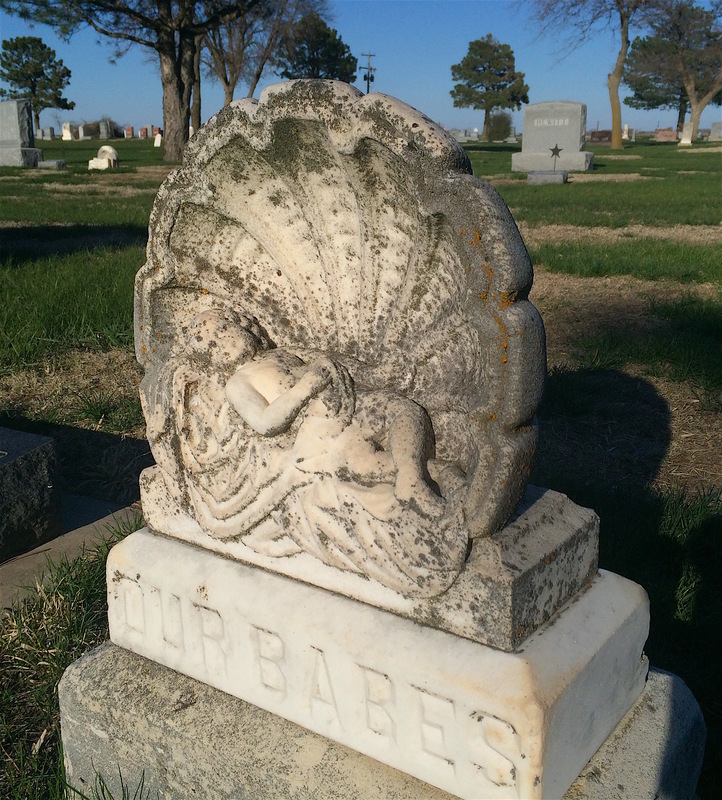 I’ve written about these “baby on a half shell” monuments in the past. They fascinate me because they were popular during the later Victorian era and some of them are intricately carved. 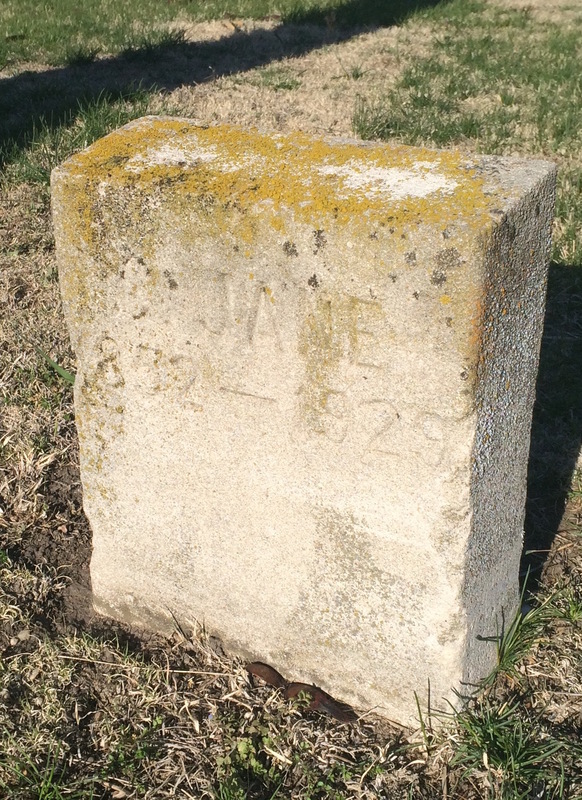 Markers such as these were often purchased by families who had lost several children but did not have individual markers. Looking through my pictures, I could not find any specific markers for individual children near this monument. But that isn’t unusual. Many times, a family simply purchased one monument to represent all of their children who died. I don’t know if these children died during the 1882 diphtheria outbreak, but it’s possible. As we left Central City Cemetery, I thought of how I could have spent several more hours there. I also thought about the Persons family, the children who died of an illness that is now easily prevented by a vaccine. How I take for granted that I don’t have to worry about my own son falling prey to it. It’s a blessing I thank the Lord for as he grows up. 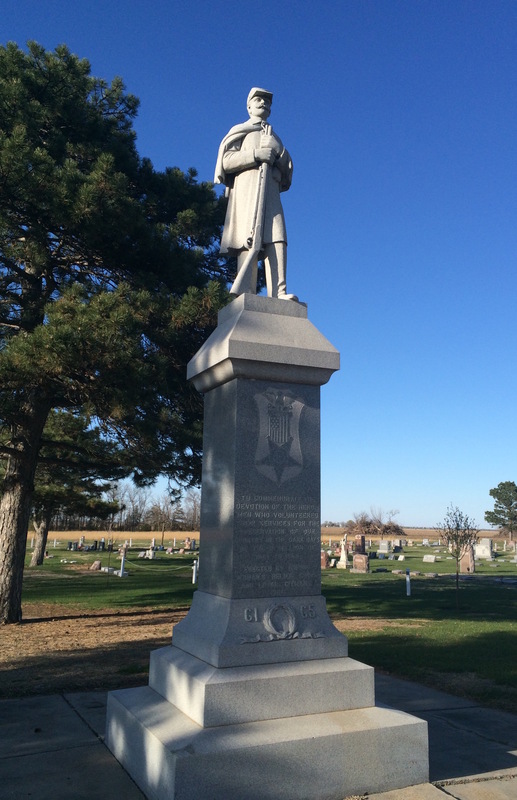 Civil War monument at Central City Cemetery. Nebraska was a territory during the Civil War but became a state in 1867.